The unmanned SpaceX Dragon capsule flew within 1 1/2 miles of the orbiting lab as it performed a practice lap and checkout of its communication and navigation systems. Officials at NASA and the SpaceX company said the rendezvous went well, although the test results still were being analyzed. The historic linkup is on track for Friday. It is the first U.S. vessel to visit the space station since NASA's shuttles retired last summer - and the first private spacecraft to ever attempt a delivery. The Dragon is carrying 1,000 pounds of provisions. The space station astronauts struggled with bad computer monitors and camera trouble as the Dragon zoomed toward them, but the problem did not hold up the operation. Indeed, all of the tests appeared to go well. "Can nicely see the vehicle," Dutch spaceman Andre Kuipers said. It is the cornerstone of President Barack Obama's strategy for NASA: turning over orbital flights to private business so the space agency can concentrate on destinations farther afield, like asteroids and Mars. "The President just called to say congrats. Caller ID was blocked, so at first I thought it was a telemarketer," Musk said via Twitter early Thursday. He ended his tweet with a smiley emoticon. Musk monitored Thursday's operation from the SpaceX Mission Control in Hawthorne, Calif., where the company is based. On Friday, two of the space station's six astronauts, Kuipers and Donald Pettit, will use the space station's robot arm to grab the Dragon and attach it to the complex. The crew will have a week to unload the contents before releasing the spacecraft for re-entry. It is the only supply ship designed to return to Earth with experiments and equipment; the others burn up in the atmosphere. The space shuttles used to be the primary means of getting things to and from the space station. Discovery is now a museum relic, with Endeavour and Atlantis soon to follow. Aboard the incoming Dragon - 19 feet tall and 12 feet across - is food, clothes, batteries and other space station gear. 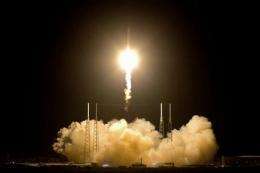 The space station and Dragon will be visible to Earthlings in select locations in the pre-dawn hours Friday, while flying tandem just prior to their linkup 250 miles above the planet. Among the many U.S. cities with viewing opportunities if skies are clear: New York, Los Angeles, Washington, Chicago and Jacksonville, Fla.
SpaceX has managed to drag NASA into the 17th century (AKA metric), be nice if phys.org could make the leap. SpaceX has managed to drag NASA forward into the 17th century (AKA metric), be nice if phys.org could make the leap. Corner Stone of of Obama's Strategy ??? B...Sh..
Late 18th century, actually, but your point still stands! But, probably the main reason the mercans prevaricate going to metric is because they (still) hate the French ! You Guys are hilarious.You should get together and start a movement.Make sure you take a laxative first.But it appears that none may be needed. While SI units are certainly good to use we shouldn't forget that the definion of the meter - or the second, kilogram, ampere, mole and kelvin for that matter - have been set no less arbitrarily than using someone's foot as a gold standard. They're all based on something that is repeatable and measurable, and assumed to be sufficiently invariable, which is not what a king's foot is. Besides, they are not entirely arbitrary; for example the origin of the lenght of the meter is 1/10000 of a quarter of the distance around the earth, or from the north pole to the equator through Paris, so it would align the meter with the gradians, or 400 degrees per revolution, so one degree on the map would be exactly 100 km, and one centigradian would be a kilometer. A nice thing if you're a cartographer - simplifies your calculations a lot. Yes, that is why they are good units (though the kg has exhibited a vexing drift in recent years). But a kings foot was not repeatedly used for measurement. it was used to make on primary measuring rod and from that all others were calibrated. This is EXACTLY the way we still do it (with the exception of not using a human foot as primary source). Point being: The length of a meter (or a second) and the base in whcih we represent them are arbitrarily chosen ones. Which is not a fixed distance (and wasn't measured to exact enough specs anyhow). Continents do drift (and so does the axis of rotation - i.e. the north pole). Your not fit to write about science achievements! Oh, wait, she writes for AP, that explains it.